I'm still trying to cram in all the unwritten blog posts about Japanese life before we leave this island. This one is dedicated to the "art" of construction. 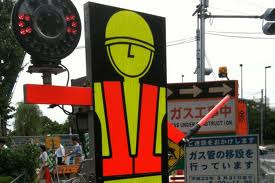 The Japanese have distinct ways of doing things that, as a foreigner, I have found fascinating and one of them is how they do road construction. Not the actual construction work mind you, but I guess you could call it more the safety prep. Of course they're signs warning you of upcoming construction. But I love that they always have a serene picture on them - either of flowers, sunsets, puppies, etc. - I guess to assuage your uprising road rage? Yep, that would be a picture of a person bowing and a sign saying "Thank you for your cooperation and understanding to our project." They're saying they're sorry for fixing the road and causing you an inconvenience! It's a countdown clock, just before we got the green arrow, there was a red "x" with the seconds until you could go counting down. Considering we were on a twisty mountain road with a sheer drop off the side, I'm really glad the Japanese are rule-followers! The end result of all this stuff is that rarely do you have traffic slow downs around construction. And it is kind of entertaining to drive through!